What Fab.com showed the world was that the integration of social media into a newly-formed community-based website can work. 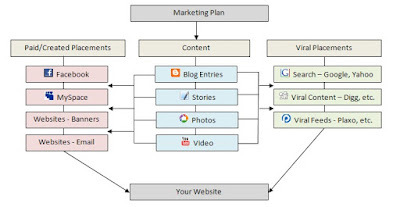 Websites for consumers seem to have followed a basic pattern, starting in the mid-90s as informational resources and then slowly, over time, graduating to the level of building true community, with tools for a website’s members to interact with each other, comment collectively on articles they had read together, meet each other and more. The power of Internet chat rooms, message boards and even the basics of membership profiles that were searchable by other members of a community website cannot be overstated. They commanded some of the highest valuations during the dot.com boom and survived intact and even stronger after the dot.com bust. In the LGBT space, sites including Gay.com, PlanetOut.com, GayWired.com, 365Gay.com and others prevailed and dominated the online LGBT online world for over a decade. They were featured in the Wall Street Journal as taking the LGBT community to entirely new levels heretofore unseen prior to the advent of the Internet and its early adoption by the LGBT community worldwide. What we are seeing today is what can possibly be described as that 3rd wave of online technology forming entirely new communities online. Consumers have flocked to social media to the order of 600 million on Facebook alone. They are uploading photos, sharing videos, posting links to some of their favorite articles and news stories, and so much more. Just this past New Year’s Eve, a record 750 million photos were uploaded on Facebook, making this site one of the largest photo repositories in the world. From this ocean of content, those cutting-edge, community-based websites that can integrate with social media are poised to tap into this flood of information, harnessing and distributing it to newly-formed audiences drawn together for a wide variety of motivations and reasons, including in the case of Fab.com, to connect with other gay men of similar interests. On Fab.com, a person’s events they selected to attend on Facebook were ported over to the Fab.com website. All of a sudden we had gay event crowd sourcing, where we could go to one website to try and figure out what events were hot and which ones were not. Better yet, any other Fab.com members attending the very same event were highlighted and displayed with that event’s information, very similar to what Facebook was already doing, but in Fab.com’s case, connecting people who were not already connected as Facebook friends. Fab.com also ported over the various check-ins from Facebook Places (Facebook’s answer to FourSquare.com), allowing other members to see where other gay men were going in various cities around the world. All of this was completely opt-in only, meaning this information was only shared by those who wished to share it. What this technology did, however, was allow our Facebook activities in the LGBT world to be amplified and to find new audiences outside of the walled garden of Facebook where this information was being shared only with our friends. Simultaneously, GayCities.com began offering very similar features, and with their strength already established in the world of gay travel, integrated the vast world of FourSquare.com check-ins as well. Thus, LGBT people from around the world were able to share in real-time what was hot and what was not, whether that was an upcoming event or a neighborhood bar. One might ask what the significance of all of this really is. I believe the answer lies in that ocean of social activity that is coming from Facebook, Twitter, LinkedIn, YouTube and Flickr. People don’t have the time nor the patience to join a variety of social networks where they would have to duplicate their photo and video uploads every time. Sites that tap into a person’s social media activity and share it with those select communities a person wishes to join are becoming that 3rd wave of online community-based websites, serving the infinite number of niche-oriented communities we all gravitate to on a personal level. 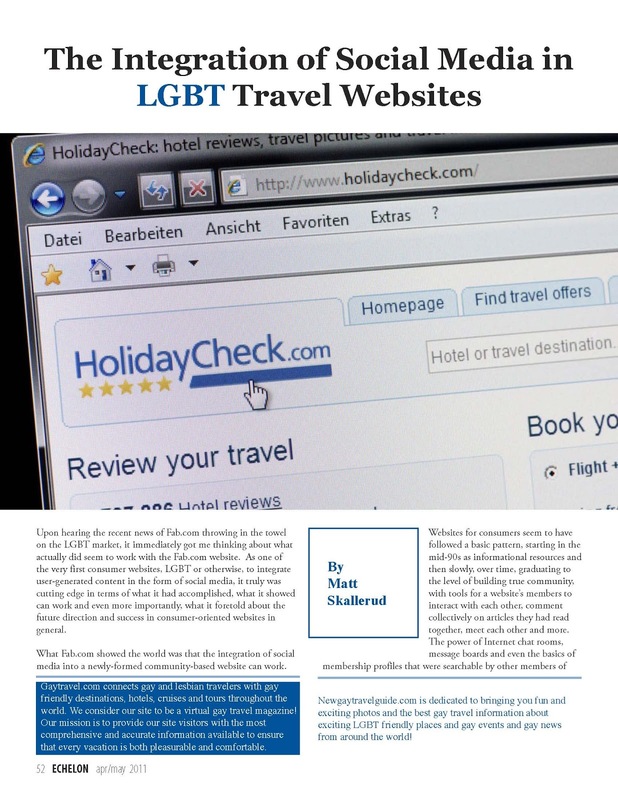 The travel community has always been ahead of the curve in the gay & lesbian marketplace, and this 3rd wave is already playing itself out in this community, with Fab.com and GayCities.com in the consumer travel world and sites such as IGLTA.org in the business-to-business travel world. When a destination, as an IGLTA member, creates a new YouTube video to highlight their region, or posts a new blog entry about some upcoming event, or uploads new photos on their Facebook or Flickr photo page, these activities are immediately shared with other IGLTA members, as well as gay travelers, allowing a destination, a tour operator, a hotel and more the opportunity to amplify their marketing voice and reach a much wider audience with no extra effort on their part. 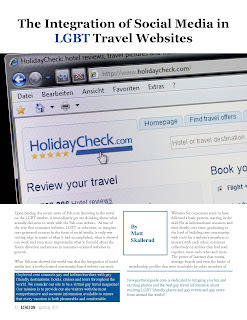 New sites are coming online more and more frequently, with recent website launches serving LGBT travel communities in Las Vegas, Philadelphia and other cities around the world, integrating social media with their travel community websites along the way. In years past, a travel magazine hired writers to travel the world and write incredible articles along the way. In recent times, Yelp, TripAdvisor and FourSquare showed us the power of user-generated tips and reviews and how strong their influence was when it came to people making their travel decisions. In the LGBT space, GayCities.com took the lead in serving this specific need. In today’s world, what Facebook has shown us is that everyone who travels and posts their activities online is a travel writer, so to speak… an individual travel journalist with a unique story to tell, perhaps with an audience of just a small handful of friends, or perhaps with an audience in the thousands, following their exploits and adventures on a daily basis. These people exist today, and their expanded reach in this new network of socially-connected, community-based websites… this 3rd wave of online community, has just begun.